2012 was one of the most eventful years I can remember in my 20-plus years working in and following the Chinese film business. It was the year in which China surpassed Japan to become the world’s second largest movie territory. It was a watershed year for investments from China into North American entertainment (more on this below) and from North America into China. IMAX continued its bold theater expansion, opening its 100th screen in the PRC, and Fox bought a stake in producer-distibutor Bona Group. Both IMAX and Fox were rewarded with superb returns this year on their China investments. 2012 was the year when Hollywood showed that it can dominate the Chinese market, with a 63 percent market share in the first six months. 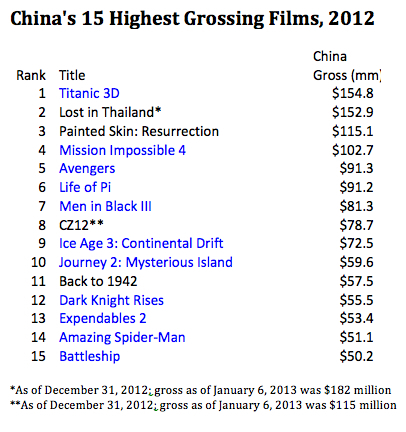 It was also the year China’s filmmakers proved they can dominate their market too, notching two of the year’s three biggest hits—Lost in Thailand and Painted Skin: Resurrection—and three of the top four if we include CZ12’s revenues into the first week of 2013. All of these films were $100 million-plus grossers. 2012 was the year China’s government finally capitulated to years of WTO pressure by expanding its import quota and increasing foreigners’ revenue-share allowance to 25 percent. It was also the year SARFT aggressively protected China’s domestic films via extended foreign film blackouts and manipulation of release schedules to prevent Hollywood from exceeding its “allowed” share of the market. It was a year when China’s film czars issued repeated warnings and censorship dictums to reinforce the Communist Party’s chaste rules of on-screen propriety and its strict prohibition of films that challenge the legitimacy of the Party’s autocratic rule. It was also the year when the country’s giant government-owned TV network, CCTV, aired a national broadcast of the U.S. film V for Vendetta, which details and glorifies the actions of a terrorist who violently overthrows a totalitarian regime. It was a year when a Chinese company, Dalian Wanda Group, became one of America’s biggest theatrical exhibitors through its acquisition of AMC Theatres. It was also a year in which Chinese films dismally failed to attract American audiences, with the top ten Chinese language releases in North America—several of them huge hits in China—collecting a combined gross of barely $1.75 million at U.S. multiplexes. Above all, it was a year of enormous growth. Let’s break down the numbers. 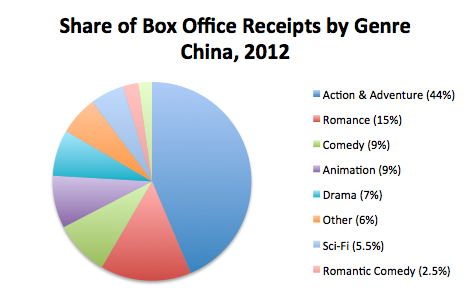 SARFT announced last week that China’s theaters earned a total of 17.07 billion RMB in movie ticket revenue in 2012. Using an average currency exchange rate of 6.31 RMB per dollar, this works out to $2.71 billion dollars, good enough for a 31 percent increase over 2011. That’s the ninth year in a row that China has logged a 30 percent or better increase (as measured in U.S. dollars). 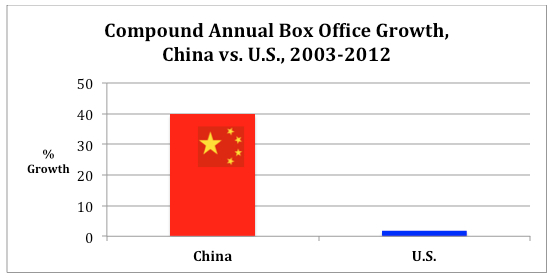 During the past decade China domestic films revenues have grown at a compound annual rate of 40 percent. Had the North American market grown by the same rate it would now be a $190 billion industry. Unfortunately for those of us in Hollywood, North America has grown at the sluggish pace of just 1.8 percent annually, less than one-twentieth the growth rate of China, so we are in jeopardy of being surpassed by China—even if its growth slows considerably—in just five to seven years. At that point China will account for one in every four dollars of worldwide ticket sales. 2012 saw five new film releases go on to gross $100 million or more in China, more than reached that mark in all of China’s combined prior history. Three of those five films are of Chinese or China-Hong Kong origin and one, Lost in Thailand, will become China’s highest grossing film ever with a total of at least $215 million. I believe this qualifies as the highest gross ever for a film in a single territory outside of North America. To make the list of the top 15 films in 2012 required a $50 million gross; in 2011 the threshold was $30 million, and in 2010 it was $23 million. Foreign films took more than half of all ticket revenue, reportedly the first time this has happened in China in a decade, according to SARFT. The vast majority of this share went to Hollywood movies. But Chinese films fought back and gained share in the second half, with purely domestic films capturing 20 percent and China-Hong Kong co-productions taking another 25 percent. If SARFT succeeds in its future manipulations of the market, foreign films will never again capture more than half of China’s ticket revenue. 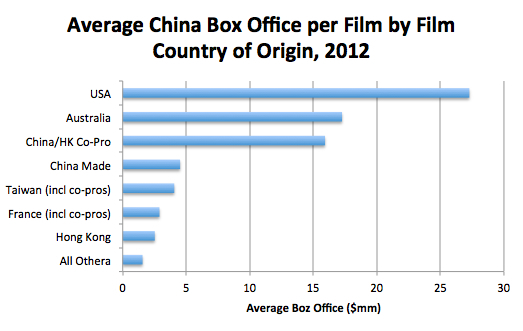 Of course, had China allowed in more American films, the US share would have been greater. The average American release earns six times as much in China as the average Chinese film, and quite a few US (and other foreign) films are shut out of the market due to censorship concerns and quota limitations. 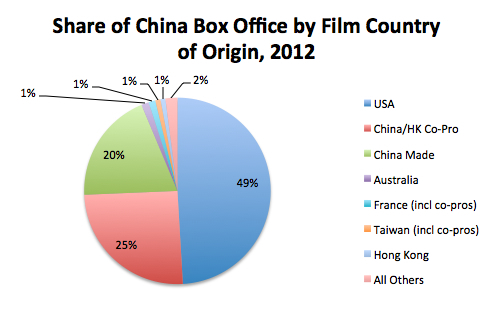 Had China completely eliminated its import restrictions in 2012, and had it not instituted blackout periods, there’s little doubt that non-Chinese films would have easily taken at least two-thirds of the box office. Action and adventure remain the top drawing genres, expanding their share from 30 percent of revenues in 2011 to 44 percent in 2012. Romance surpassed science fiction as the second most popular genre, as several love stories, most notably Titanic and Painted Skin 2, drew large numbers of moviegoers to theaters. Animation’s share dropped from 15 percent in 2011, when Kung Fu Panda 2 set records and some very tough comps, to just 9 percent in 2012. Sci-Fi fell even further, from 17 percent of receipts in 2011 to just 5.5 percent in 2012. Comedy rose by 2 points to 9 percent in 2012, largely on the back of mega-hit Lost in Thailand. Chinese audiences spend on movies far out of proportion to their incomes, and the extraordinary growth there shows little sign of slowing down. China added more than 3,800 new movie screens last year to reach a total of 13,118 screens by year’s end. If we factor in the massive skimming that takes place at China’s ticket counters, total box office last year was probably closer to $4 billion than to the officially reported $2.7 billion figure. 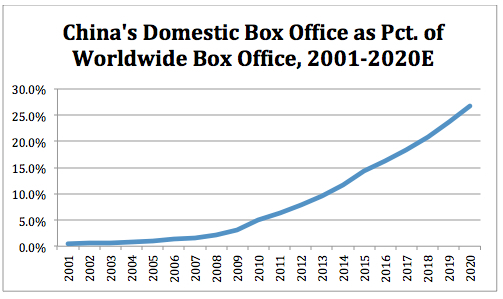 China’s new status as the world’s second largest box office territory will be short-lived because China will soon surpass North America, and in 15 years or so it will dwarf the United States in importance to the global film industry. Chinese filmmakers still have much to learn, but they will be backed by the full weight of the Chinese government in protecting their interests and helping them to compete. The successes of Lost in Thailand and Painted Skin: Resurrection demonstrated that Chinese audiences prefer mediocre local films that are at least “good enough” to better quality foreign language movies. And with government support, more and more Chinese films that are “good enough” will appear. The window is closing on Hollywood’s prospects in the PRC, and only those companies that remake themselves as more China-oriented producers will stand a chance of benefiting from the future’s biggest growth opportunities. This entry was posted in Analysis, Box Office Reports and tagged 2012 China box office, 2012 re-cap, Animation in China, China box office, China box office share by country, China box office share by genre, Painted Skin 2, Rob Cain, Robert Cain, Titanic 3D by chinafilmbiz. Bookmark the permalink. Wrong, the record goes to Spirited Away with $229,607,878 (around $300m corrected from inflation). Loup, thanks for your correction. Lost in Thailand could still theoretically beat Spirited Away’s record, but not on an inflation-adjusted basis. Think you too for your articles. Oops, I forgot the recent new records in China, it was in fact Avatar’s and Titanic’s 27/28m admissions. Lost in Thailand has already beaten Avatar’s admissions record. Admissions are of course a valid measure of response to a film. The reason I don’t refer to admissions numbers is that ticket prices vary so greatly over time and geography. You refer to the USSR, which indeed had huge admissions numbers for many films, but ticket prices were usually well under a dollar, and tickets were in many cases paid for by state organizations and were thus free for the attendees. In my opinion those admissions numbers aren’t valid for purposes of comparisons. In France we, at the contrary, consider dollars not a good at all unit for comparisons (but I understand it is a good unit for business men) in term of success. (Inflation and ticket prices vary a lot among countries). Admissions are a very good indicator for comparisons in “modern-era” (I think since around 1991 in ex-communist countries, since the 70’s in occidental Europe and since the 60’s in USA, according to annual ticket admissions), when the annual ticket admissions vary to much the comparisons are quite biased to compare a success, even if to my astonishment some records were beaten recently, with 2 to 4 times less annual admissions in some counties, some movies are still able to have huge “snow-ball effects”). Fascinated by how well Australia has done in 2012. Do you know the breakdown on what these films were. I’ve heard that Bait took about $30-$40m. Would this one title be sufficient to put Australia in 2nd place behind the US? Bait took in US $25.7 million; Happy Feet 2 another $8.8 million. Killer Elite and The King’s Speech (both Aussie co-pros) accounted for another $6 million between them. That was pretty much the story for 2012.